The Fort was founded in North Carolina in 2012 By Jake Gardner, formerly of Villalobos Rescue Center and Animal Planets hit TV show "Pit Bulls & Parolees." After many years rescuing dogs across the United States, Jake decided it was time to move on from Villalobos and do something good somewhere new. Taking all the knowledge and experience gained and relocating to North Carolina in order to provide relief to an area that desperately needs help. 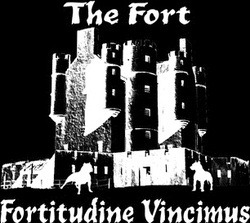 Fortitudine Vincimus, Latin for "By Endurance We Conquer." The Fort is A Non-Discriminatory Pit Bull Rescue. While our focus is primarily The American Pit Bull Terrier, a life is a life and we will never discriminate against a dog based on breed. The Fort is serving animals in an area of North Carolina where well over 30,000 dogs enter into the local shelters every year. Sadly, the vast majority don’t stand a chance at life. Not only are they euthanized, but most suffer a horrific and inhumane death in antiquated, and many times not properly functioning, gas chambers. The Fort-Fortitudine Vincimus Rescue Center, is a no kill, non-discriminatory rescue dedicated to alleviating the suffering of all dogs, in particular the American Pit Bull Terrier. This is an area where most dogs stand little to no chance of surviving once entering shelters, many of which have euthanasia rates of close to 90 percent. Entering the shelter, a Pit Bulls fate is all but sealed. Most local shelters refuse to allow them to be adopted and they are almost immediately euthanized more often than not. We work with local shelters as well as many of the other foster based rescue groups in the area. We are currently in the process of trying to build kennels at our new location, in order to help on a much larger scale by being the only rescue facility in an area that desperately needs help. We believe that every dog deserves a loving, caring home that will give them the best life possible, the life they deserve. We are avidly working towards improving the lives of all animals through education and promoting spaying/neutering to reduce overpopulation, thereby aiming to lower shelters extremely high kill rates. Our focus is rescuing and adopting animals to loving homes that are looking to welcome a new member to the family. We believe in the humane treatment of all breeds and animals, no matter how large or small. Thank you for taking the time to visit, we are looking forward to having you on board with our cause!